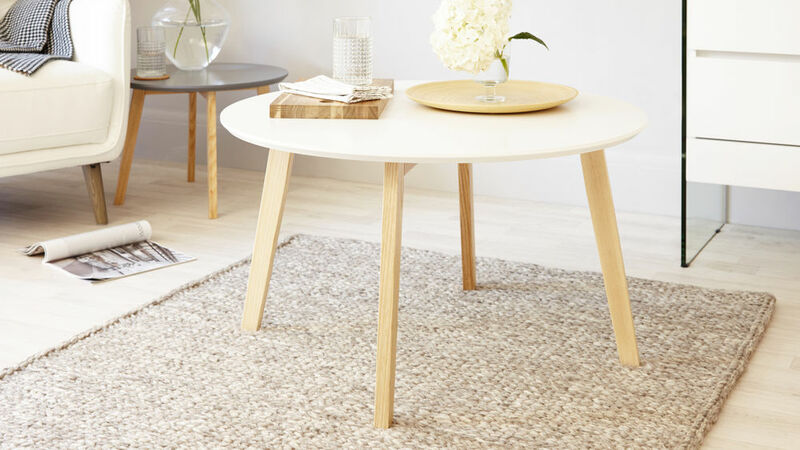 The Penny White and Oak Coffee Table has such a relaxed Scandi style, making it a simple but very effective way to add a modern touch to your living room interior. The combination of its solid oak legs along with the crisp white matt satin table top allows you to introduce both natural textures and contemporary finishes to your space, all the while providing a handy surface for your TV remotes and drinks. 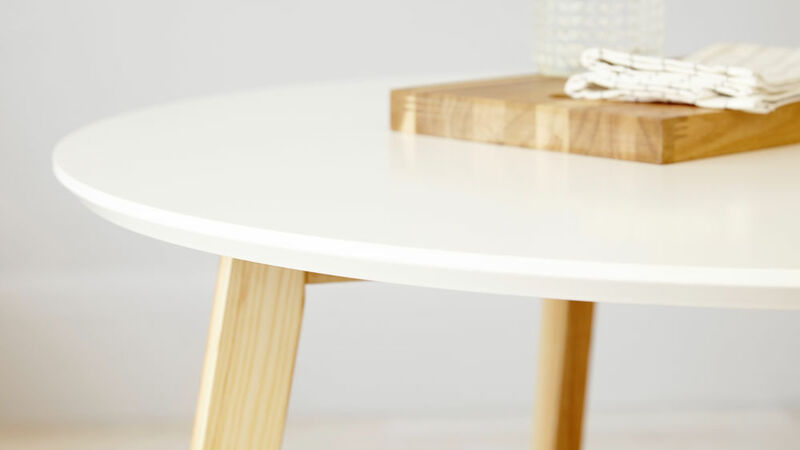 The Penny Coffee Table has a satin white matt finish. A matt finish isn't reflective but it does has a gentle sheen and wonderful tactile quality to it. It's a much more subtle alternative to a high gloss surface as it still brings a bright and fresh look to your living space, just without being highly reflective. The round table top of this modern coffee table has a smooth chamfered edge. This creates a much softer look while also being very child friendly as there are no sharp corners to bump into. The four legs of the Penny table are made from solid oak and are slightly angled. This subtle detail gives the coffee table a much more considered and well designed look, while also keeping the area underneath the table looking open and spacious. 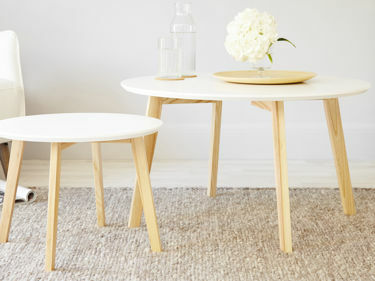 Measuring at 45cm in height and 80cm in diameter, the Penny Coffee Table is fairly lightweight. This makes it easy to move around and really maximise your space. The Penny Coffee Table is an individual piece but you could easily style it alongside our coordinating range of Penny Side Tables. This will create a larger surface area for you to place and store your items, with the added option to move the coffee table and side table apart when needed. All of our Penny Coffee Tables come with floor protectors to prevent marking your flooring. This means the coffee table would work really well on a hard floor, a rug or on carpet. With its with oak legs and white satin round table top, this sleek coffee table will instantly add a fresh and contemporary feel to your living area. The mix of materials makes the Penny coffee table incredibly easy to style alongside pieces in your existing interior, while its sizing means it won't take up too much of your room. After a splash of colour? The Penny Coffee Table is also available with a grey or yellow matt satin top. One of the great things about the shape and size of the Penny Coffee Table is that it can be styled alongside our range of Penny Side Tables. The tables work really well together as the side table is slightly lower than the coffee table, creating a truly stylish setting in your space. 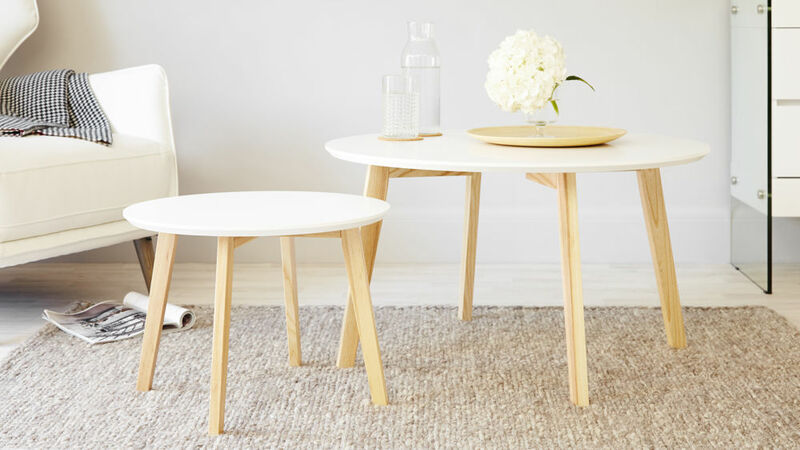 The Penny Coffee Table and Penny Side Tables create a good looking set together but it also means that you have two separate items when you need them, such as when you have family or friends round and need to pull up another surface to place drinks and snacks. It’s also a great opportunity to mix up the colours in your space, as you could choose the Penny Coffee Table in White along with the Penny Side Tables in grey or yellow.